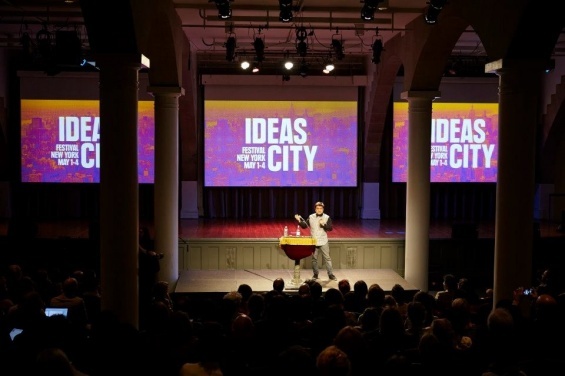 This year’s IDEAS CITY Festival will take place May 28–30 and centers on the theme of The Invisible City. Dozens of artists, one hundred organizations, and tens of thousands of visitors will come together to explore questions of transparency and surveillance, citizenship and representation, expression and suppression, participation and dissent, and the enduring quest for visibility in the city. - The designers shaping the cities of the future must engage with an increasingly challenging set of hypothetical conditions—scenarios that often remain invisible to their inhabitants. How do urbanists, architects, and activists create habitats that anticipate drastic future change such as overcrowding and climate change? - A vast proportion of our lives exists as an invisible online record of our identities, interests, and affiliations. What role do data and privacy play in the perpetuation of democracy in the twenty-first century? - We are increasingly dependent on global-network infrastructures that are as invisible as they are vast. How can networks and processes be made more transparent, accessible, and empowering? How can they guarantee accountability? Can art be the connective membrane in this process? - Within the city, an increasing number of people—such as the homeless, the elderly, and undocumented immigrants—are disappearing from sight. Is there a cartography to identify those who have wandered or been driven from the center? Watch the event on the New Museum’s Livestream. In the information age, we are increasingly dependent on global-network infrastructures that are as invisible as they are vast. These networks dictate the dynamics of decision-making and the shape of power structures, from government records and trading platforms to the seemingly more “democratic” web and social media. How, as citizens, do we relate to the networks, infrastructures, and technologies that underpin urban life today? What role, if any, do they play in promoting justice and accountability, thereby shaping the future of society? How can art and culture encourage awareness of the centrality of data in twenty-first-century life? The age of network culture offers new, powerful tools for individual and collective expression, and in response, the act of protest is rapidly evolving; individuals, groups, and entire communities once conveniently invisible to decision-makers are self-organizing to make their voices heard. From Cairo to Istanbul and from Barcelona to São Paulo, the sight of public squares inundated by a sea of protesters has become one of the key images of our time. At the same time, an increasing number of people—the poor, the homeless, the elderly, the mentally ill, and undocumented immigrants, to name just a few groups—are disappearing from sight. How do the disenfranchised find representation in the city today? Is there a cartography to guide those who have wandered or been driven from the center? This panel will analyze the social and political crises triggered by new technologies, the shifts in the balance of power within society they are bringing about, and the role of art in defining a new paradigm of social justice. As the speed of technological innovation accelerates, life in the twenty-first century metropolis is coming closer to fulfilling the predictions of science-fiction writers of decades past, and not always for the best. Many of the most apocalyptic scenarios envisioned by novelists—extreme overcrowding, conflict driven by climate change, the crisis of capitalism, mass uprisings—have also become all too familiar. Could it be that the solutions to today’s challenges are already written? What can architects learn from the wild speculations of their literary heroes? Two of today’s most acclaimed voices from the fields of architecture and science fiction discuss their visions for life in the near-future metropolis. As more and more people flock toward urban areas, the size and complexity of cities is growing exponentially. As a consequence, the designers shaping the cities of the future must engage with an increasingly challenging set of hypothetical conditions—critical scenarios that remain invisible in the day-to-day lives of today’s inhabitants. In light of the entreaty made by Daniel Burnham (author of Chicago’s seminal modern master plan) to “make no little plans,” how will urbanists, architects, and activists think about creating a habitat that anticipates drastic future change, overcrowding, and climate change? What are the guiding principles in an architecture that is preventative? This discussion will analyze both the extraordinary challenges of designing for unpredictable conditions, accelerated change, and the new opportunities that arise when one takes radical change into account. Everything we do, from messaging our friends to streaming music to using public transport, generates information. 90 percent of the data in the world today has been created in the last two years alone, and its sheer volume means that a vast proportion of our lives exists as an invisible online record of our identities, interests, and affiliations. Yet even after recent revelations of mass collection on the part of governments, we take surprisingly little interest in what happens to our data. This panel will comprise internationally renowned researchers, activists, and geographers whose work is organized around the practice of making visible, through art and activism, the critical importance of data and privacy to the perpetuation of democracy in the twenty-first century. To make a map is an inherently political act. By documenting that which is unfamiliar and invisible, maps define our universe; they not only document the organization of physical space, but shape its future form. Cartography is almost as ancient as humanity itself, yet it is undergoing unprecedented change. Once drawn and managed by an elite few, maps are increasingly collaborative, open, fluid, and freely accessible. What is cartography’s potential as a form of activism in the twenty-first century? What will the map’s role be in shaping the city of the future? How can it guide us through the Invisible City?